How to draw a production planning Gantt chart and present the procedure visually? Refer to this page to learn production planning with visual and interactive Gantt charts. With the development of science and technology, production planning is used in almost industries around us, such as agriculture, clothing and cosmetics etc. 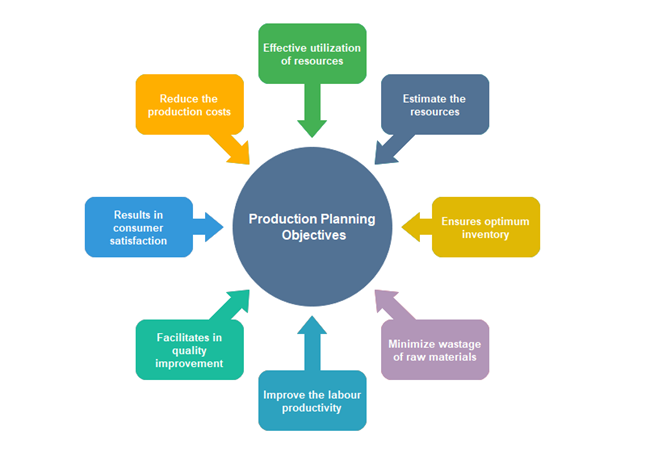 Production planning involves not only planning of production but also of manufacturing modules in an enterprise. By making use of resource allocation including work of employees, materials, manufacturing equipment and production capacity, production planning serves different consumers in different industrial fields. Determining the required product mix and factory load to satisfy customers needs. Matching the required level of production to the existing resources. Scheduling and choosing the actual work to be started in the manufacturing facility. Setting up and delivering production orders to production facilities. Why Use Gantt Chart for Production Planning? Forecasts the problems that may arise in the production process and adjust to deviations to ensure on-time delivery. Assign tasks with accurate time distribution to schedule the whole production precisely. Bottleneck response, line rerouting, and material substitution are possible in real-time. Task dependency enables workers to adhere to and carry out the plan with clear and sequential arrangements. Stakeholders are able to estimate the investment, respond to bottleneck problems and know the production progress in real time. Cost to production is lowered by strict budget on work, equipment, and material resources, thus removing causes of wastage. Accurate calculation of material usage and load promotes cost effective material planning. Estimate available resources for the production capacity. Improve functionality and performance of manufacturing machines. 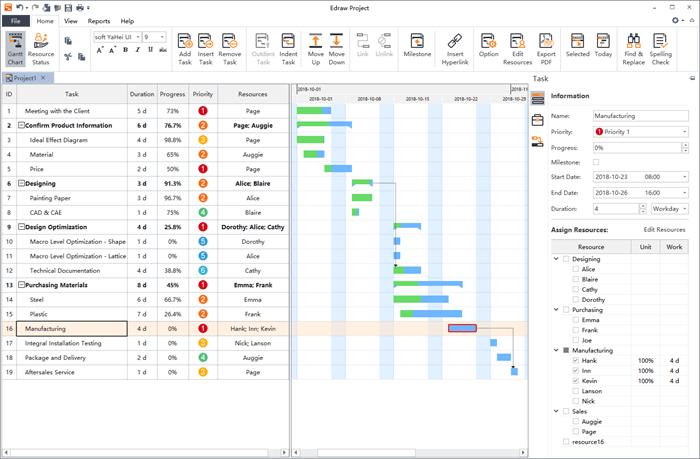 Applying Edraw Gantt chart software to production planning prepares a detailed plan for achieving the production goals economically, efficiently and in time. Horizontal axis bars representing timelines, duration, start-end date, and the completion times of tasks that are involved. The Reports options of Edraw Project allows the product planner to generate reports on the production from different perspectives, analyze, visualize and share important information with stakeholders. It gives an overall picture of production palnning work breakdown and task reporting relationships, so that the planner could gain insight for budget planning and work resources allocation. To help you understand how Gantt charts benefits production planning, here are some gantt chart examples made by Edraw Project. You may get inspirations in production planning from these examples. Click on the picture or the text below to download and customize the example for free. From what has been described above, you may have a basic understanding of what production planning is, the advantages of using Gantt charts for production planning, and how to create Gantt charts for production planning. If you hope to deliver your production plan with planned efficiency and coordinating work resources, using Gantt charts would be a nice try!